Bread...why do we buy it! It's super easy to bake, taste great and you can leave out all the preservatives found in store bought bread. Four simple ingredients and you've got yourself bakery fresh bread. In a large bowl, combine flour, yeast and salt. Add the water and stir until all the ingredients are well incorporated: the dough should be wet and sticky. Cover the bowl with plastic wrap. Let the dough rest 12-18 hours on the counter at room temperature. When surface of risen dough is dotted with bubbles, it is ready. Turn sticky, risen bread in another bowl lined with parchment paper. Let rise 2 more hours. Note: This step of parchment paper is to give you a way to transfer the dough to the hot cast iron dutch oven easily without popping a lot of the bubbles. Preheat oven to 425 degrees. 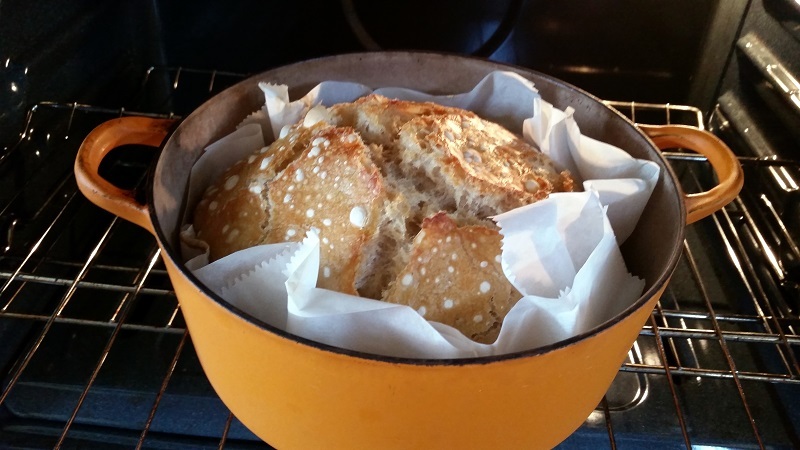 Place a 6-8 quart covered cast iron dutch oven in your oven to preheat. Once all preheated, transfer dough cradled in parchment paper directly into hot dutch oven. Cover and bake for 40 minutes or till internal temp reaches 200 degrees. Uncover and continue baking for 5-10 more minutes to brown top. Remove bread from dutch oven by carefully grabbing corners of parchment paper. Let cool on wire rack.